It doesn’t take long to realise that Lapland is like no other place on Earth. One step off the plane in Kiruna – Sweden’s most northernmost town, home to just 18,000 people and twice as many huskies – is all that’s needed to feel the full effect of the -30°C temperatures. Look up, odds are the sky will be pitch black, irrespective of the time on your watch. You’re told to expect it – Lapland receives just four hours of daylight in winter – yet you’ll still find it astounding. During the shortest of walks from the aircraft to arrivals, the arctic chill will worm its way beneath your many layers of clothing, and you’ll also notice your nose hairs, eyebrows and (if you have one) beard will have already started to ice over, making you look more than a little like Santa Claus. It’s almost fitting – welcome to Lapland. It’s a place that only deals with extremes, hosting 24-hour sunshine during the summer months, while winter brings a thick blanket of darkness that relents for a few mere hours a day. Sales of blackout curtains and eye masks rocket throughout the summer – as do those for sunglasses, presumably – while going anywhere without an incredibly powerful torch in the winter months is nigh on suicidal. Swedish Lapland is 120 miles inside the Arctic Circle, which adds a frosty layer of context to the freezing conditions, and explains the omnipresent panorama of snow you’ll find if visiting between November and March. The jewel of the crown in Swedish Lapland is undoubtedly Icehotel. What started as a madcap idea between friends Yngve Bergvist and Par Granlund in 1990 – to build an oversized igloo that functioned as an art gallery – has grown beyond even their wildest expectations. Soon locals and visiting tourists wanted to experience it overnight, and the concept of a hotel constructed solely from giant blocks of ice was born. 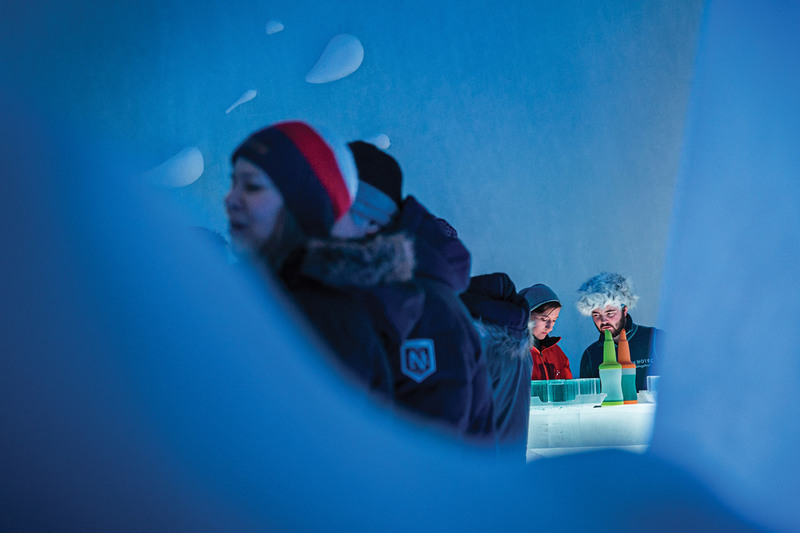 Now celebrating its 25th year, Icehotel has put the microscopic village of Jukkasjärvi – home to just 550 people – on the map, and spawned a raft of imitators. The structure is built anew every year with 9,000 tonnes of snow and ice taken from the nearby Torne River – stored in a sub-zero warehouse during the summer months – boasting 55 bespoke. 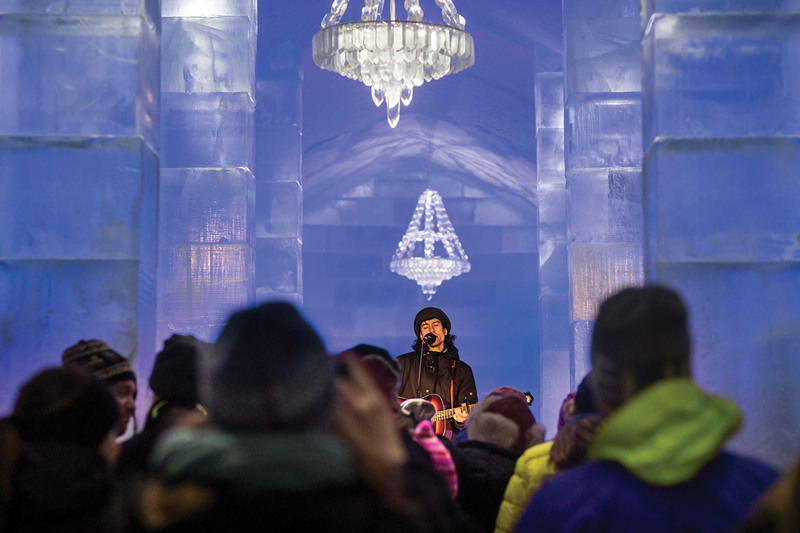 Open from December until April – at which point Icehotel melts back into the Torne and the resort rolls out its summer packages (think paddle boarding, white water rafting and other adrenalin spiked excursions in waters of the non-frozen variety) – Icehotel brings in a diverse clientele. Even those who loathe cold weather, believe it or not, as Icehotel’s standardised jumpsuits handed out upon arrival somehow reduce the frostbitten chill from hypothermic to nippy. With the temperature regulated to minus five, there isn’t a television, wardrobe or sofa to speak of. There’s not even a toilet. Instead expect a reindeer hide atop an ice block, as that is all you’ll get. Except, it isn’t. 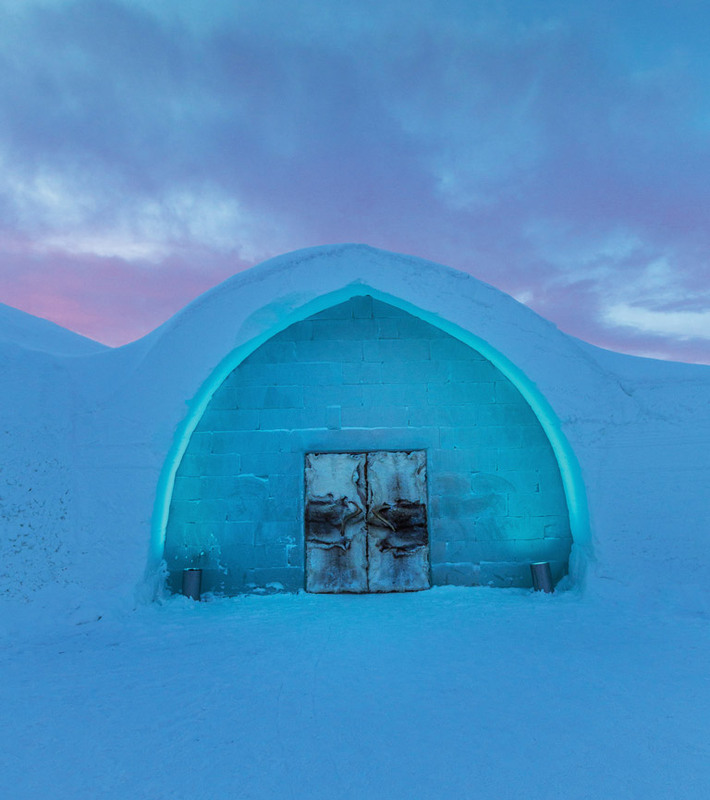 While it is an accommodation at night, by day the Icehotel is a gallery for guests and visiting tourists, and it doesn’t take long to see why. Each room is beautifully carved with ornate and original designs – genius feats of architecture all – and you might find yourself sleeping inside the icy rendering of a bell pepper, amidst a chess set or with frozen members of the animal kingdom watching over you. But you won’t miss a TV when you slide into your gigantic sleeping bag (tested to minus 50, meaning you’re more likely to sweat than shiver) and switch off the light – as you will see and hear nothing, there’s just silence and blackness. Unsurprisingly, this makes for a peaceful night’s slumber, unless of course you wake up needing the loo – as that requires a 100-yard jog dressed in your thermal underpants, and admittedly not quite as tranquil an experience. But dismiss Jukkasjärvi’s sparseness at your peril, as Lapland is so much more than an off-the-beaten-track retreat. You can spend entire mornings being schooled in the art of ice sculpting. Armed with a chisel and a block of ice, you are encouraged to take inspiration from the artwork all around, and let your imagination run wild – with the finest renderings showcased around the complex. Meanwhile, book a wilderness tour and you’ll be taken out by an identikit Swedish tour guide (blond hair, blue eyes, frightfully attractive) on a long and winding route to your own exclusive, snow-capped cabin. Even better, you’ll be travelling there by snowmobile. As a mode of transport, snowmobiles take some serious beating. Crammed with power and boasting top speeds of 130kph, the giddy head rush you feel on one of these machines is matched only by the fierce breeze that blasts your cheeks as you zoom around and endeavour to stay aboard. On your snowmobile tour you’ll follow your guide through a variety of terrain, from climbing hairpin slopes amid the winding forest, to putting your machines to the test on sprawling, wide open flats. Be careful, this writer found out personally that falling off at just 5kph stings, so rest assured that while whizzing across ice at full throttle is quite the ride, the frozen ground is an unforgiving crash mat. 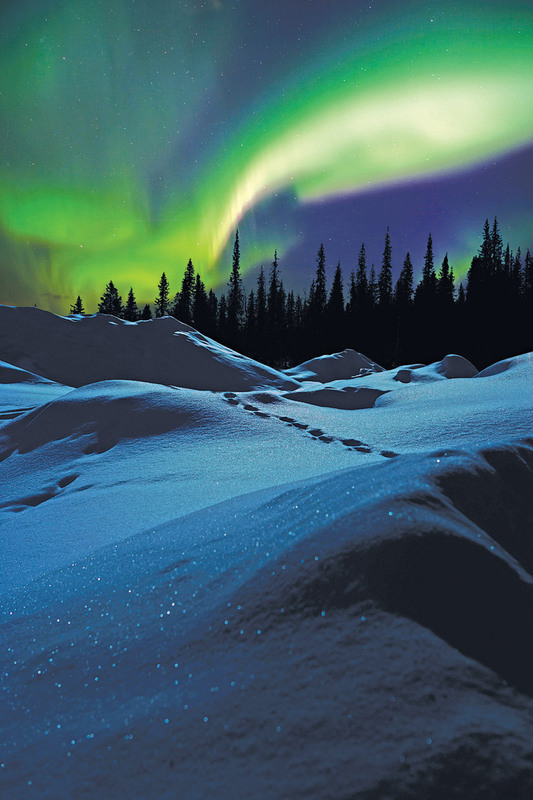 After a log cabin pit stop for a cup of warm lingonberry (Sweden’s national fruit) and sandwich, you’re in prime position to view one of mother nature’s biggest wonders: aurora borealis, more commonly known as the Northern Lights. Fleets of holidaymakers head to Scandinavia, Alaska, Siberia and beyond for entire vacations where the cosmic rays refuse to show, but keep an eye on the forecast before you go (the Northern Lights’ vibrancy is judged on a scale of zero to five) as you might just be lucky enough to encounter a gorgeous day-glo fug of green, purple and blue. From there you’ll embark on another rapid jaunt to your own secluded cabin in the woods, illuminated by candlelight and replete with fresh drinking water – direct from the frozen lake outside. Thaw your frosty limbs in your en suite sauna, then cool down with a traditional Swedish shower – basically the Ice Bucket Challenge without the charity – as your guide prepares a hearty Scandinavian feast of pot-roasted meat, potatoes and veg, along with olives, cured meats and mushrooms on toast. The following morning you’ll be treated to a breakfast of porridge and salted coffee (another Swedish delicacy), before skidooing your way back to the sprawling Icehotel complex, looking for all intents and purposes like a Christmas card. Step out into the ‘real’ Jukkasjärvi, or at least what little there is, and you’ll find a small grocery store, church and a Sami (Lapland’s indigenous tribe) museum, which has its own herd of reindeer. Just like everything else in this isolated utopia, the church is visually magnificent – its deep red paintwork amongst the ocean of white visible a mile away. Inside the Sami museum you’ll learn the historic rituals of the native Laplanders, and admire the varied trinkets proudly on display. It’s absolutely worth a visit, firstly as it might be your only chance to speak with a bona fide local (who’ll impart regional knowledge and history lessons on the Sami people) but also as the entry fee will grant you access to the grazing reindeer in the adjacent field. These creatures will be pleased enough to see you – provided you bring along a bag of food from the gift shop, that is. Be warned: although the reindeer are fairly docile, it’s highly advisable to keep an eye on their antlers at all times – else you run the risk of returning home without both eyes. If it’s wildlife that appeals, Icehotel offers a husky sledging excursion that provides a hefty injection of adorable animals, alongside a picturesque tour of Jukkasjärvi – conveniently scheduled for when the sun is brightest in the sky. 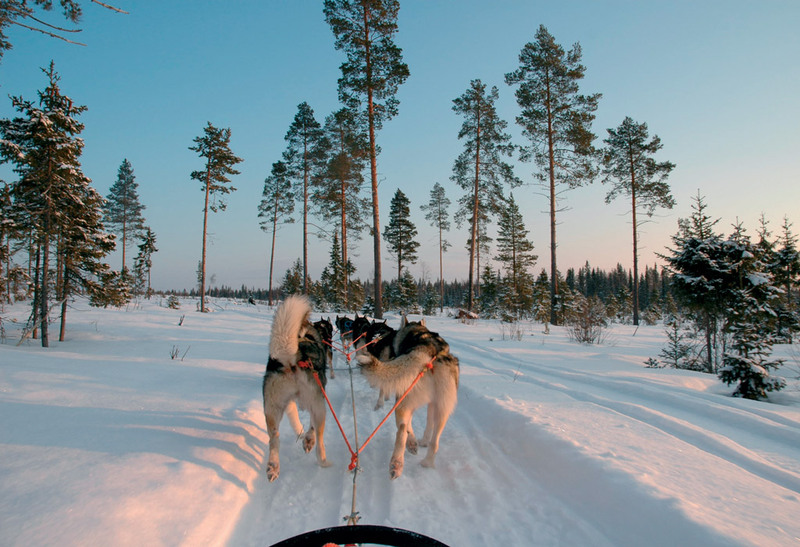 Take your seat in the sledge, and the previously yapping huskies go silent the moment your driver shouts “mush” (or whatever the Swedish equivalent) and take flight. Gliding along the frozen River Torne in daylight gives you the chance to truly admire your surroundings – the wintry sun beaming in the sky while every snow-covered tree, house and patch of land glimmers beneath it. Seldom a house for miles around, you’ll appreciate just how remote a location you’re staying in. As with most other excursions you’ll stop midway for a fika (coffee and pastry break). You’ll also be granted an opportunity to get hands on with your fur covered chauffeurs, as they take a well-earned respite. Not that they’ll need long, as after roughly 30 seconds they’ll start howling again , desperate to embark on yet another run. The culinary scene in Jukkasjärvi is limited by nature, yet what it lacks in choice it more than makes up for in quality. After a long day out in the cold you’d settle for just about anything to restock the calories you lost through shivering, but head to the luxurious Icehotel restaurant and you’ll find a la carte dining of Michelin star quality. With a tangible sense of tranquillity permeating every inch of the hotel’s grounds, the restaurant is no different – bustling but not packed, atmospheric though not noisy, with waiting staff on hand at a moment’s notice. Full of warm, personal touches, the head chef may explain his menu to you at the table, and make recommendations based on what’s in the kitchen paired with your palette. The menu often changes, but the starter of duck with foie gras is a rich treat, whereas you’d be strongly advised to forget the antlered friends you made and opt for a traditional reindeer steak without remorse. Then, for dessert, sample the customary lingonberry parfait over the tempting allure of chocolate – it’s customary, after all. Half a mile up the road the rustic, timber-built Homestead restaurant sits right on the river. The building dates back to 1768 and is also a museum, while the organic, hearty meals will warm you as much as the flickering fireplace. With spectacular Swedish meatballs, reindeer stew and moose all on the menu, along with Scandinavian beer and wine, you won’t regret going native with your dinner choices. Be sure to fill up, both your glass and your plate, as you’ll need plenty of fuel, and that extra layer of fat, when retracing your steps home in the blizzard conditions outside. In case we didn’t mention, it’s mighty cold out there.